And, Nellybelle. 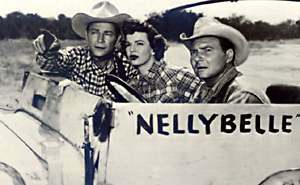 I bet you’d forgotten ‘ole Nellybelle, she was the Jeep. They lived at the Double R Bar Ranch outside of Mineral City in modern times. The show was mostly kid stuff and predates the so called “adult” Westerns like Gunsmoke and Wagon Train. Gene Autry was his main competitor. 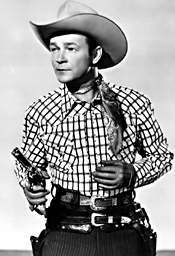 Roy Rogers took a successful movie career and moved it to the little screen of TV. 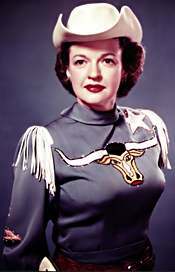 Rogers, whose real name was Leonard Slye and who was born in Cincinnati, Ohio, had become known as the King of the Cowboys. He was one of the first to see the potential of TV and zealously guarded the show to insure success. He sued the network to prohibit exhibition of his movies in competition with the TV show and won. In answer to the question: Yes, he had Trigger stuffed. Really. Pat Brady died in 1972 in an accident. 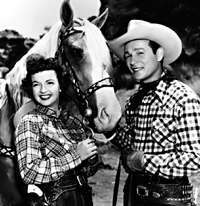 Roy Rogers (real name Leonard Franklin Slye) died in 1998 of congestive heart failure, followed by his wife Dale Evans in 2001. 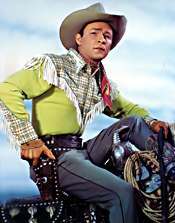 TV Guide’s Roy Rogers Page, with TV Listings, Photos, Videos, Exclusive News and More. While watching the Errol Flynn 1938 version of Robin Hood, did Olivia de Havilland’s horse, Golden Cloud, look familiar? Well, he should. That’s Trigger before he came to Roy Rogers! One of Trigger’s roles on his way to superstardom.